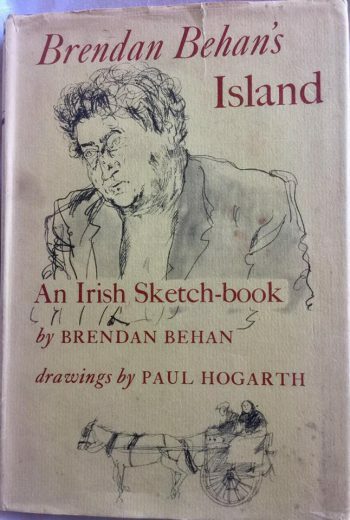 Brendan Behan’s Island was the first of two collaborations between the Irish poet and writer Brendan Behan and the artist Paul Hogarth. First published in 1962 by Hutchinson & Co it is a travelogue of sorts covering the people and places of Dublin, Galway, the North of Ireland, counties of the South as well as the Aran Islands. Alongside Hogarth’s drawings the writing is interspersed with poems and songs, steeped in Irish folklore and romance. But the book tells us as much about the author as it does of the subject matter, Behan had a direct style of writing, his ‘pull-no-punches’ attitude in life came through in his writing and Hogarth, often to his exhaustion, saw the process at first hand. In his excellent autobiography Drawing on Life Hogarth recalled the difficulty in keeping Behan out of a pub long enough to drive anywhere and achieve anything in the creation of the book. Whilst Hogarth admired Behan’s authority on the history and folklore of Ireland, including the history of the Irish Republican Army, he despaired of Behan’s drinking sessions to the point he wrote of his relief to leave Behan and his wife in order to make drawings in other parts of the country. 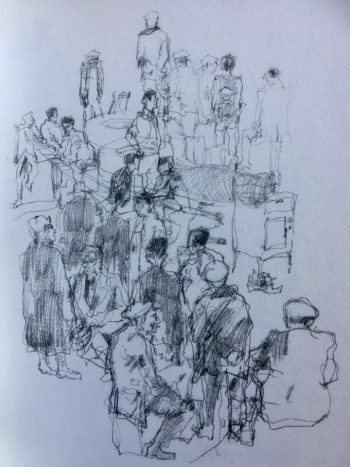 The drawings beautifully reflect Behan’s Ireland, his caricatures depict the working class culture of the country in the early 1960s with its sense of camaraderie and boisterous celebration of national identity. 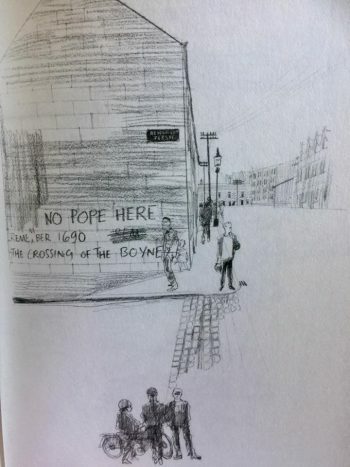 The drawing opposite reflected the troubles of the period and how the graffiti strewn walls stood alongside the buildings and landscape of an Ireland rich in history from centuries past. 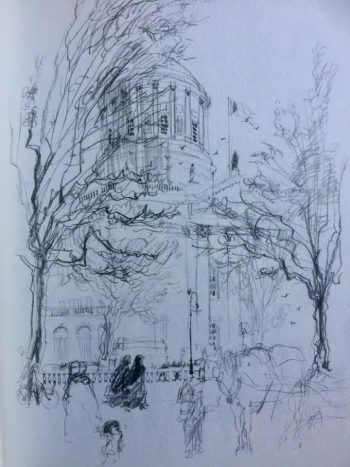 It is this deep sense of history and the importance it held in Behan and his associates hearts which comes through time and again in both the narrative and the drawings, that Hogarth, as an outsider was able to capture scenes and characters which reflected that is to the credit of his memory as an artist. So often, Hogarth’s sense of restraint and perceived simplicity of lines do so much to give a sense of the time, his portraits of the working class across the globe show the realities of life in the middle part of the twentieth century and for many, such as those in Ireland, it was far from easy. Hogarth met Behan as his health was rapidly declining, ravaged by drink fuelled ill health, Behan would die two years after the publication of this book. He collapsed at the Harbour Lights bar in March 1964 and died shortly afterwards in hospital. He was given a full IRA guard of honour at his funeral, a Republican to the very end. But despite the difficulties Hogarth encountered he still managed to work on a sequel, this time the setting was America and the book entitled Brendan Behan’s New York. published in the year of his death. Both books are still relatively available to buy online, the majority of them seem to be from the United States in varying condition. For me, it is a collaboration which deserves to be remembered, Behan was a remarkable man and author who lived life to the absolute full, Hogarth’s contribution to the illustrating of the twentieth century cannot be underestimated and this is a book which was written under the most rebellious of conditions, capturing a time and place many will recall with a mixture of fondness and sadness.